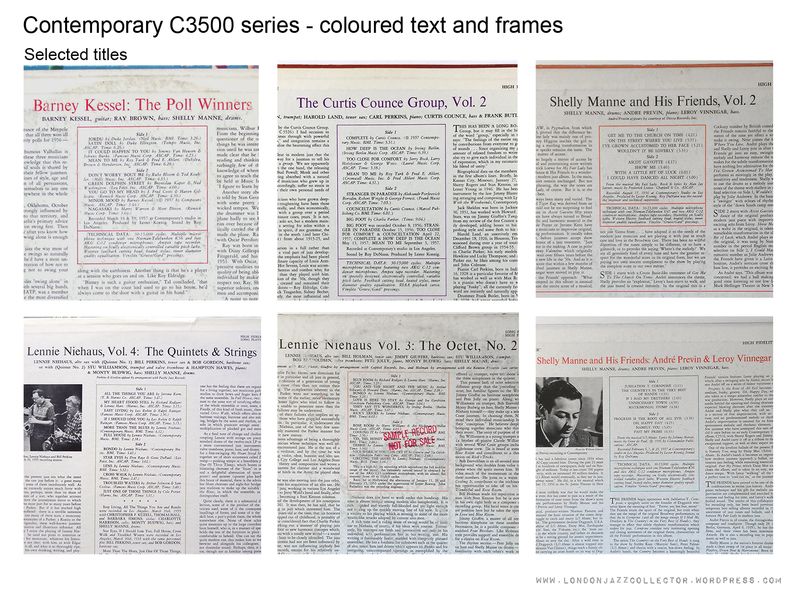 First edition of many of the early releases in the C3500 series enjoy a special feature on the liner notes: coloured print in titles and coloured frames around the track listing. 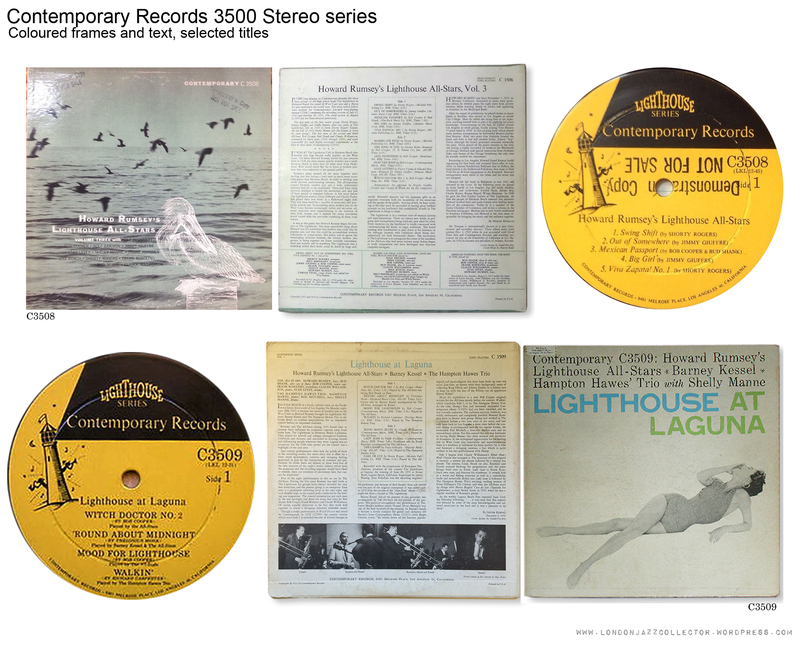 The Lighthouse series also have their own distinctive label. 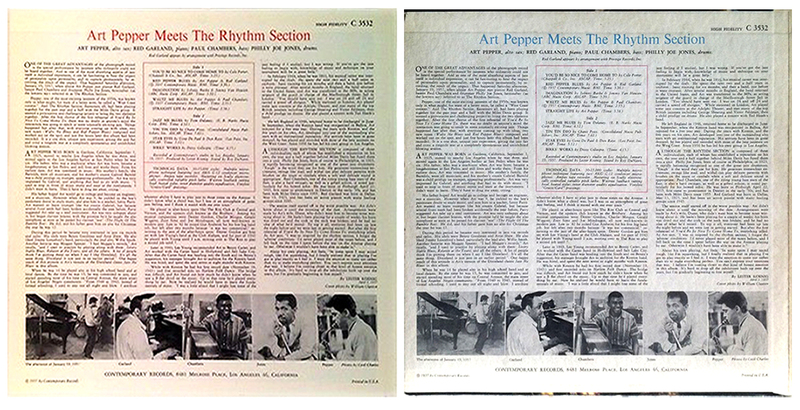 The most famous controversy remains which is the first cover of the classic C3532 Art Pepper Meets The Rhythm Section, Red or Blue? 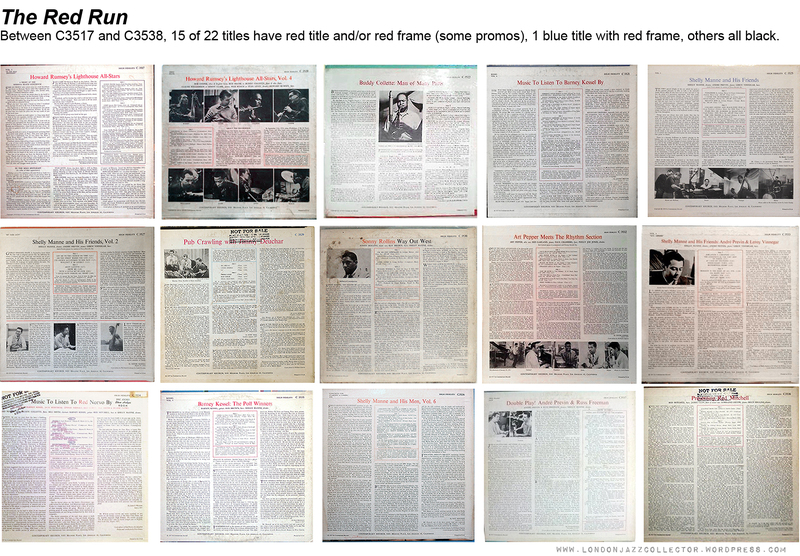 The majority of early titles in this part of the catalogue have red test titles, though other colours do appear. 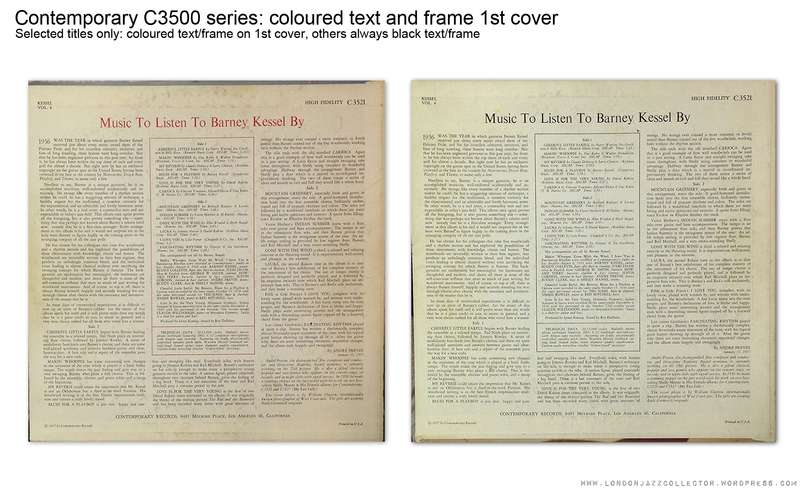 Coloured print and frames were abandoned after C3544 The Music of Bob Cooper being the last. Below this number, the absence of colour indicates a later cover except for those only issued in black print and frames. 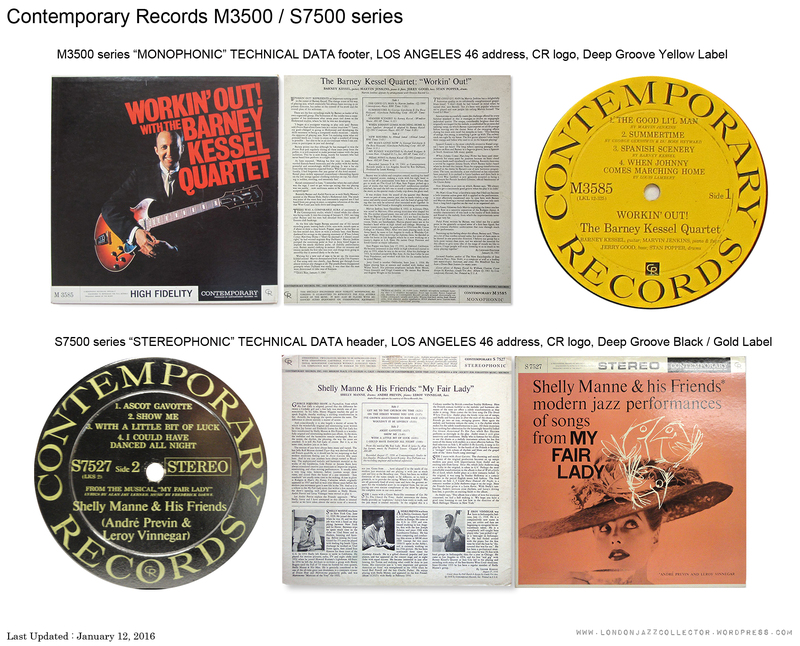 Most Contemporary stereo records in the S7500 series went on to be reissued later in the ’60s and ’70s, distinguished by a change in the appearance of the liner notes seen below. The essential knowledge is the cover address: up to 1963, Los Angeles 46, then California 90069 until 1979, when Contemporary adopted P.O. Box 2628 California 90028. These changes coincided with reissue initiatives for the best selling titles. Contemporary cover detail is highly significant, because the recording date and copyright date on the liner notes remain fixed across the entire thirty year reissue history of the label, and beyond. 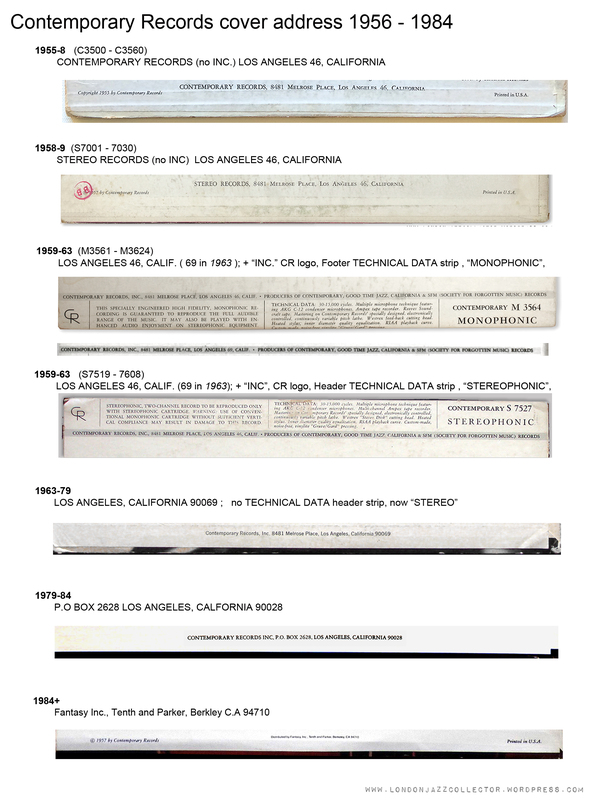 If the record was issued in the 1955-59 era , the address must be Los Angeles 46 with no Technical Data strip. 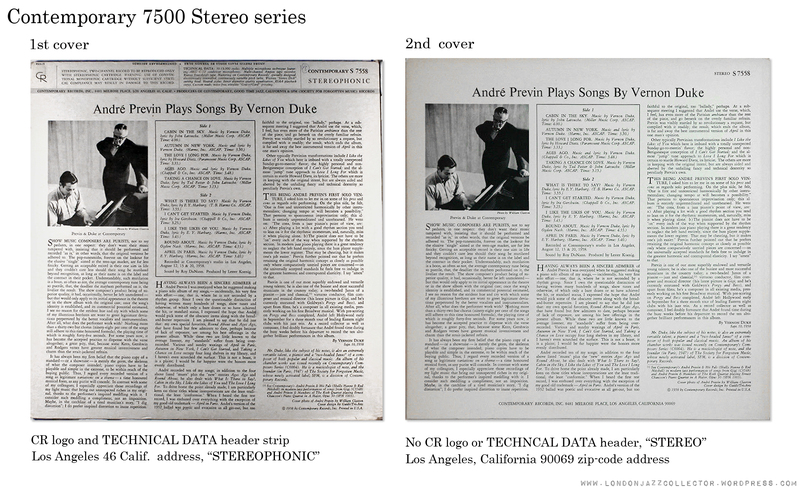 If it was issued in the 1959-63 era, it should have a technical data strip with the 46 address. In 1963 it changes briefly from 46 to 69. Beyond 1963 the full address ends California 90069 . In the last five years of the company pre Fantasy, many of the big selling titles were reissued using the P.O.Box 2628 California 90028 address. That address is the only information you are going from Contemporary. However you can get more information from detail in the runout.